For those of you who use the 9th Street tunnel as a short cut to the Southwest Waterfront, DDOT released a traffic advisory that the 9th Street bridge over I-395 will be closed starting today for the next 360 days. From the traffic advisory: "The project will make the bridges safer and more aesthetically pleasing. The concrete bridge deck on the 9th Street Bridge will be replaced, including a new walkway and staircase to Frontage Road at L’Enfant Plaza. The work will also include the replacement of the bridge bearings, structural repairs to the 10th Street Bridge beams, new roadway lighting, milling and resurfacing of the approach pavement and re-painting the exterior girders on the bridges. DDOT will also repair the roof slab of a DC Water and Sewer Authority (WASA) pumping station that is beneath 9th Street." While the 9th Street bridge will be closed, the 10th Street bridge will remain open for most of the construction period. 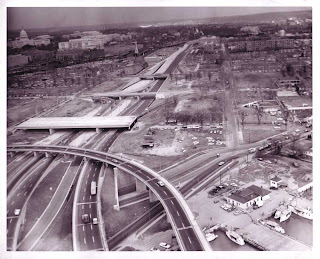 The above photo (courtesy of DDOT) shows the SE-SW Freeway around the year 1970. The white road in the left-center portion of the photo is 10th Street, which was still under construction at the time. Above 10th Street is 9th Street and its ramps to the freeway. That bridge REALLY needs work ... only 359 days to go.